Custom printing your own materials is fun and easy to do. You can experiment with different things and the possibilities that you can do on your designs are endless. Experiment and adjust templates to your desired size and shape, you can also use different colors and die cuts. However, you must always remember that there is a process that you should follow. This basic stuff is the foundation of how your prints are done and are applicable even for your custom prints. 3. It can easily pique an audience interest. 4. It is easy to recognize. You must always put in mind that whatever your prints are, they are the primary representation of your company. It emanates what you want others to see in your company and the values that you represent. 2. Image and style must be consistent with the company’s image and branding. Not only must you make sure that the shape and style of your logo would look good, you should also make sure that you are consistent with your company’s vision. 3. Do not over design and only choose the proper colors. Do not make things too complicated. Make it easier for the people to remember your campaign. Also, choose colors wisely because if your color combination is wrong, you risk irritating the people’s eyes. 4. Consider the text. Make sure that it is legible and that it is readable. Also make it short and concise – meaning more memorable. Witty lines are also a plus and will help you in making your advertisement a hit with your target market. 5. Originality is important. If you copy other brand’s advertisement, the audience will surely notice it and your image will suffer greatly. Usher in new ideas and fresh outlook on your products. Remember that you should not copy certain elements of other advertising materials, just use them as an inspiration for other ideas. 1. Having your materials custom printed has its advantages. First, you are able to choose the different aspects of production that you want to use like finish and gloss as well as size and shape. 2. Second, quality is always assured. 3. 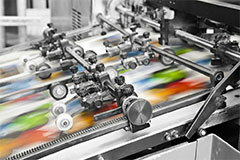 Most importantly, your prints will always be fresh and original to your audience. Because of the different options available, it is unlikely that you will repeat the same idea again and again. Also, the execution of your ideas will be smoother and more personalized.